I've seen some really cute things involving robots lately and it got me motivated to make something robot-themed for myself. This card was more of a test than anything. I wanted to see how it looked embroidered onto a notecard before I decided to put it onto something bigger (a pillow perhaps). I think he turned out pretty cute and I'll show you how I made him. 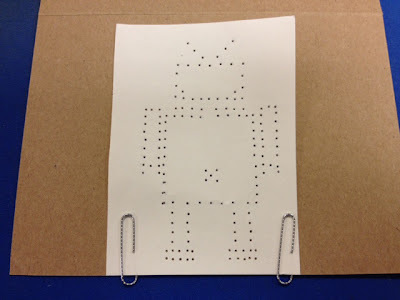 ____________________________________________ Here is what you'll need to make your own: blank notecard(s) robot template needle embroidery floss scissors pen ____________________________________________ First off - if you're not into robots - I'll show you how I made my pattern. 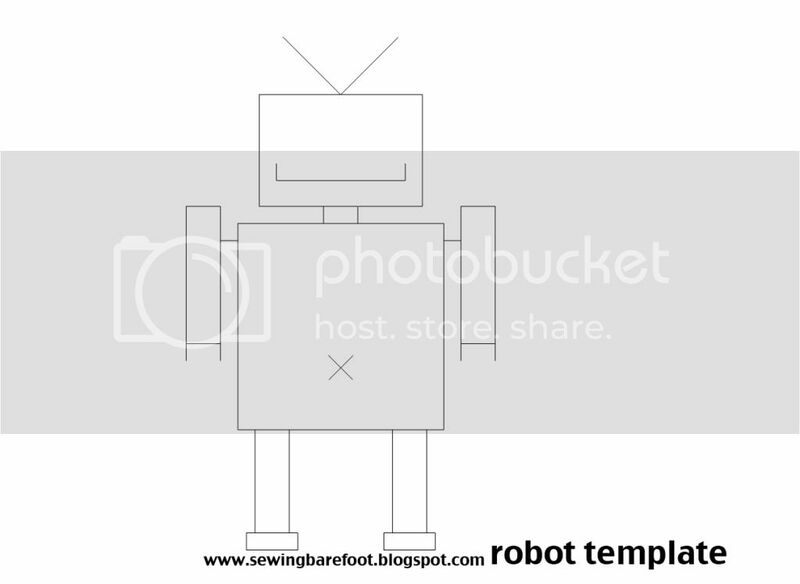 Using SketchUp (a free google program that I use when designing) I drew a robot guy for a template. I got my inspiration for this robot from here. You can turn anything into a template, so if you see something you like - go for it. After my robot was the way I wanted him, I printed him out to a size that would fit my cards and I put dots where I wanted my stitches to go. I did quite a few dots (because I wanted a lot of stitches) but you could definitely space your stitches out further. Once the spacing was decided on, I cut my robot out and paper clipped him in place on my notecard. Using a needle, I poked holes through my dots to create a stitching pattern on my notecard. (TIP: If you have a squishy mousepad you can lay your notecard flat and easily poke your needle through the dots. I've found this to be the easiest, least painful way of doing it). After you've poked all of your holes, you're ready to stitch. I used almost 2 arm lengths of floss and backstitched my way around the robot. For more instructions on how to do this, check out this post. I love it! I know you were doing it as sort of a "test run" but I think it makes a really cute little boy's card. I'm making cards tonight, so I may try this out. Thanks for the inspiration! Thanks! Have fun :) I love the idea of using them for a little boy's card. Maybe a birthday party invite? Lots of possibilities. Thanks for leaving a sweet comment.